Forever night blooded and an owl beyond repair, I’ve an ambivalence toward dawn that I’ve tried to shake my entire life. 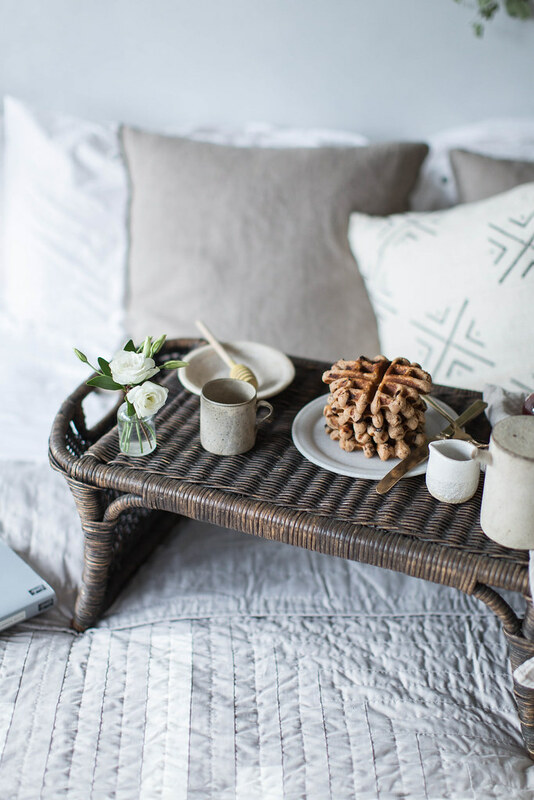 For someone that’s never been a morning person, it’s all such a fantasy: floating from bed to bathrobe, the day greeting you with coffee steam, a sizzling skillet, and a good book. Maybe some light calisthenics (this is a fantasy and in the fantasy doing crunches in the floor is referred to as calisthenics). A hot shower, fresh linen, clean hair. Sheets pulled tight & pillows strewn back on the bed. And all so routine, routine, routine. My real mornings, they aren’t always so serene. I generally prefer to stay under the blankets (in this case a quilt worth staying under, handmade by Lindsay Stead and available here.) But this is proof that even my mornings can be a dream, sometimes. I usually wake up feeling leaden, even after some odd 11 hours of sleep, and strangely attached to my dreams. I procrastinate ripping myself from that cozy womb until I have to. Which means I end up forever in a rush, throwing on clothes, not bothering with a shower (hello dry, texturizing spray), and at best having a cup of coffee shoved in my hand by midday either by my husband or a friend. They say you’re born that way, that you can never change it. I’ve yet to accept that. I fake being a morning person. And in collaboration with Lindsay Stead, I wanted to create my perfect morning beneath her quilt. So at least a couple of mornings a month, I manage to steal one that looks like this. 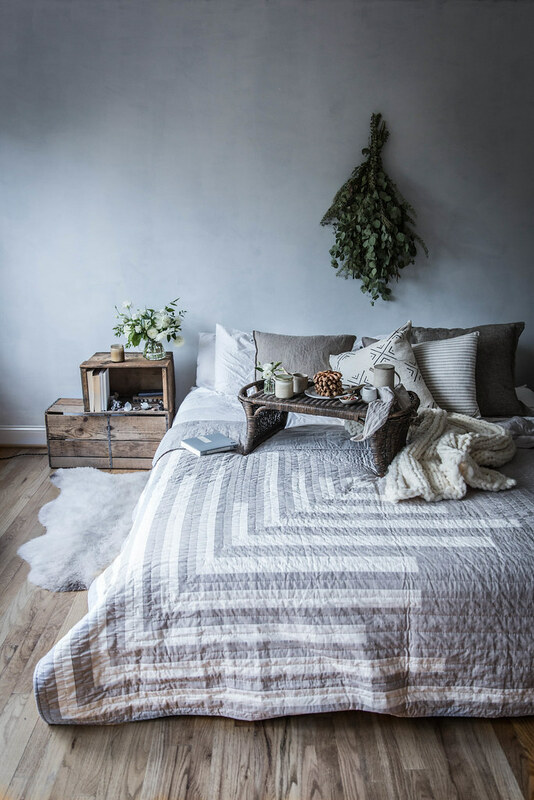 When Lindsay introduced me to her handmade, heirloom quilts, I immediately knew that they would inspire a luxurious breakfast in bed. The synergy between food from scratch and heirloom objects of everyday use that can be passed down from generation to generation is one of the things that inspires me most. 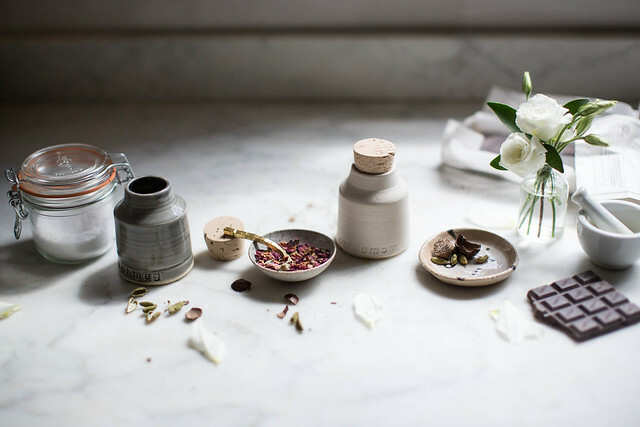 Home, food, family, and beauty around it all is the heart of slow living. And a leisurely home cooked breakfast serves as a gentle gateway into whatever else the day might hold, a buffer that begins the day with mindfulness and hopefully spills over into everything else. I can’t manage breakfast like this every day or even every weekend, but whether they come naturally to you or not, mornings like this are worth cultivating in the same way that it’s worth it to make things by hand and to support people who do. 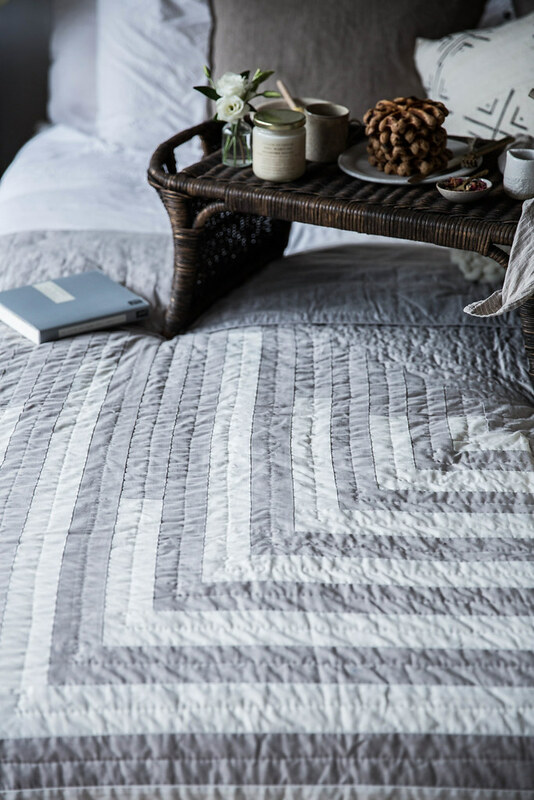 Add in the luxury of healthy homemade waffles alongside this quilt and even someone like me becomes a morning person. 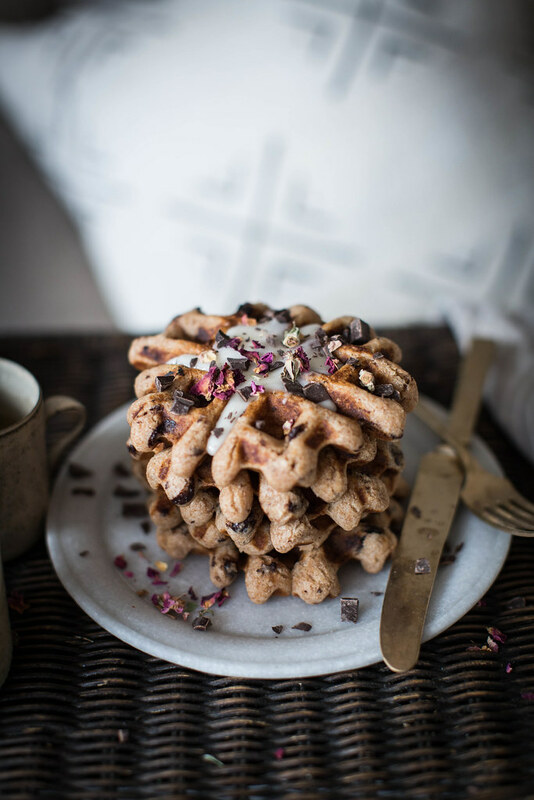 Even better, while possessing every bit of the deliciousness I attribute to, say, traditional buttermilk waffles, this healthier vegan + spelt spin on waffles is a bit kinder to your body. They’re made with healthy coconut oil, agave, whole spelt flour, and coconut milk & yogurt. 100% animal product free & you don’t miss it for a second. Though, not being vegan myself, I top them with whipped honey. So, so good. 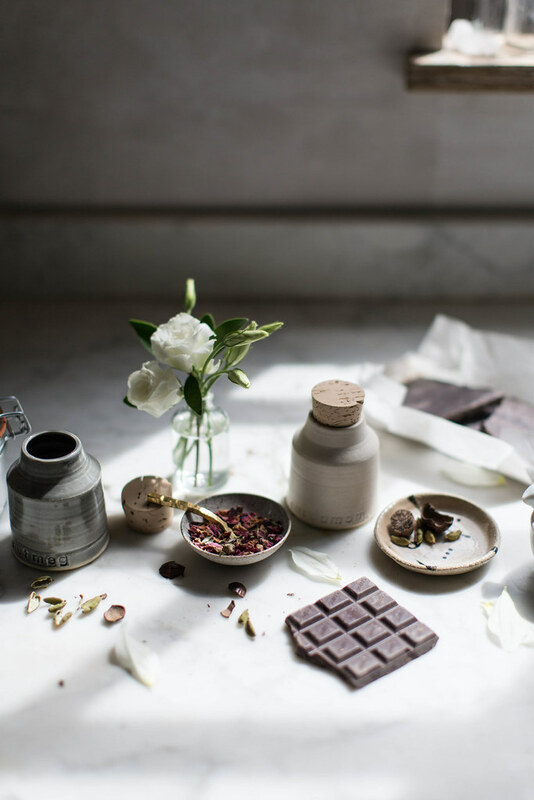 Even the dark chocolate is good for you! 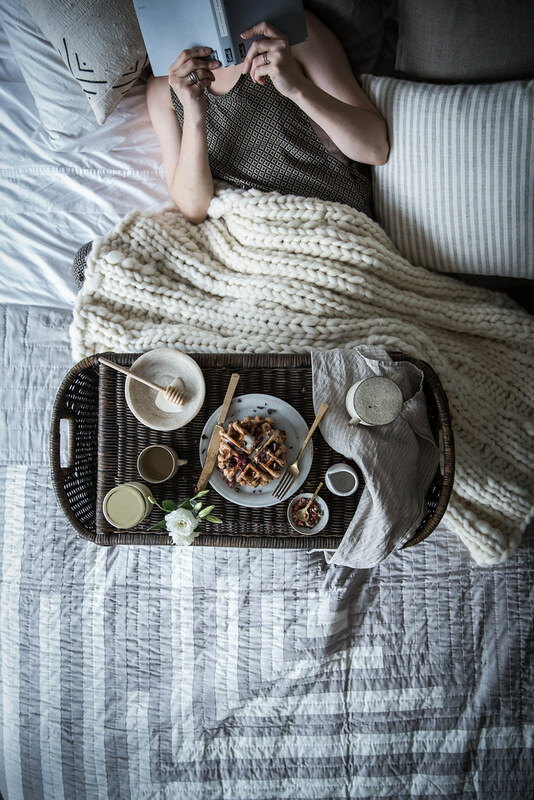 Happy weekend & happy autumn…celebrate by getting a quilt from Lindsay & getting cozy beneath it with these waffles! 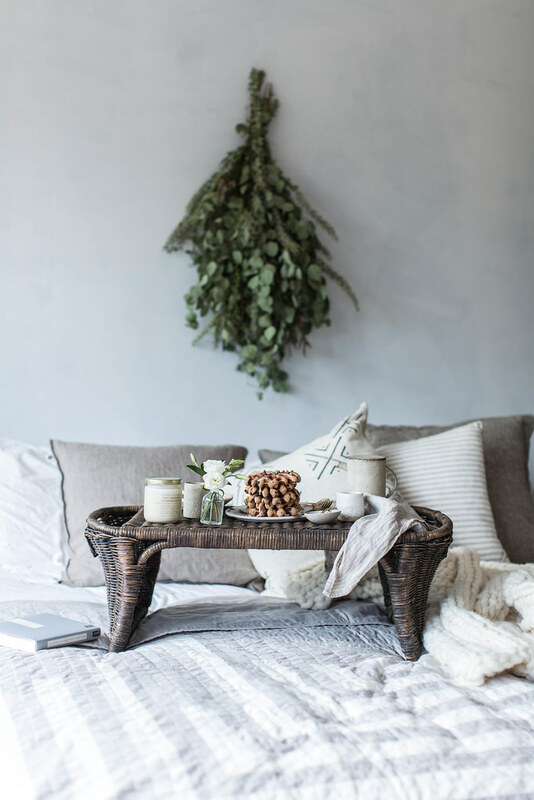 Other sources: pillows from Loom Goods & Fog Linen. Knit throw not available for sale, knitted with yarn from Camellia Fiber Co. 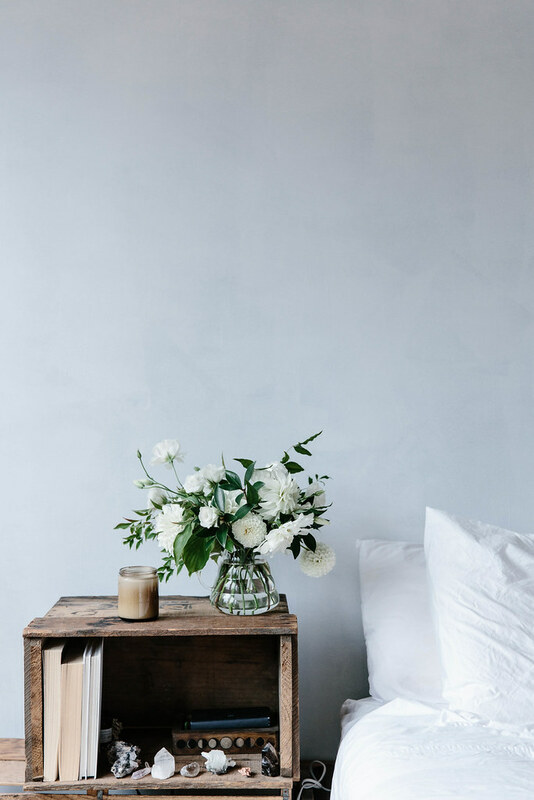 Bedside bouquet by Field + Flora. These aren't "good for vegan". They're just plain good. Perfect for a cozy Sunday morning. You can find rosewater in the middle eastern section of your grocery or at a middle eastern grocery store. If you opt to use the more concentrated rose water (like Nielsen Massey's) use far less, about 1 teaspoon or so. In a medium mixing bowl whisk together the first 5 ingredients. In a separate bowl, whisk together the remaining ingredients except the chocolate. Stir the wet ingredients into the dry ingredients until no dry remains. Fold in chocolate. Cook on your waffle iron according to the manufacturer's instructions. I cook on heat setting 4 or 5 depending on how crispy I want them, and I do 1/3 cup measures of batter for each waffle, but you could certainly do larger ones if you like. I like to serve them with whipped honey (as I'm not a vegan), but it would be great with whipped coconut cream or a drizzle of agave or maple syrup if you are! Amazing photos. I will try these definetly. I’d love to see a photo of your waffle iron. Yes please! My “Belgian” waffle maker doesn’t make ones as sumptuous looking as these. Really loved reading this post and your photos, as always, are perfectly stunning. 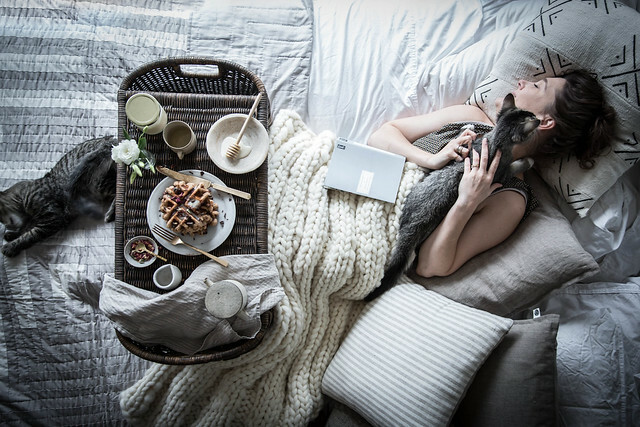 I think we all dream about those perfectly relaxed mornings, as you described, where everything is perfectly lazy but on schedule at the same time. And I can see how such a warm and beautiful quilt could inspire such a morning with breakfast-in-bed being the main feature. Thanks for a lovely recipe as well! 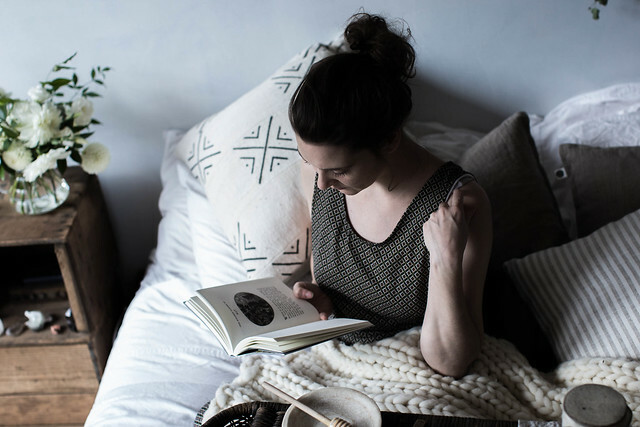 And I’m curious – what are you reading in these photographs? Ahhhh all that bedding is simply breathtaking! I am a morning person, but morning would be even beautiful-ler waking up under these. And also, you and my husband are so similar in so many ways it’s not funny. 0_0 I wake up singing and chirping he says, while he talks my ear off as I’m drifting off to sleep at night, haha! These waffles sounds lovely. But I am sort of appalled that you would promote and suggest to your readers that they purchase a $1200 quilt. That’s absurd. Good for you that you can afford such luxuries, but most people cannot. I used to really enjoy your blog, but all the pretension, inauthenticity, and flaunted privilege has completely turned me off. These quilts are handmade in a community of women that have made them for generations. $1200 is the real cost of goods & time. People are used to cheap goods that are made at the expense of foreign laborers or made in factories, goods that will fall part in few years at best. These quilts are heirlooms that you can give to your children’s children. I’m an advocate of less is more. Better to purchase one amazing blanket that graces your bed every single night for 20 years than a few. It isn’t about pretension or privilege and it certainly isn’t inauthenticity (whatever that means). It’s about paying people who work hard for their work. About saving up for goods worth the investment. About not expecting things to be cheap because we’ve been trained to expect that by big box stores. These are women trying to make a living at a lost art. I support their ability to make a living wage doing that. Period. But Beth, you must look the other way, to people who could never come to afford somthing on that price range and yet, still need to keep warm. I totally agree with you, with paying the just price for people’s work and excluding those big stores who base their earnings on modern slavery, but some people simply cannot afford to, they cannot even afford to save for that, and must have clothes and shoes and blankets immediately, being forced to turn to stors where they can buy at a price range they can afford. I speak for myself, not for others, and though I would love to be able to not have to buy at certain department stores where I know those clothing item have been the work of modern day slavery where the people working on those factories are paid miserly wages, I have to, because I cannot afford any other alternative – and I have been one of those workers being forced to work many hours and being paid miserly wages. 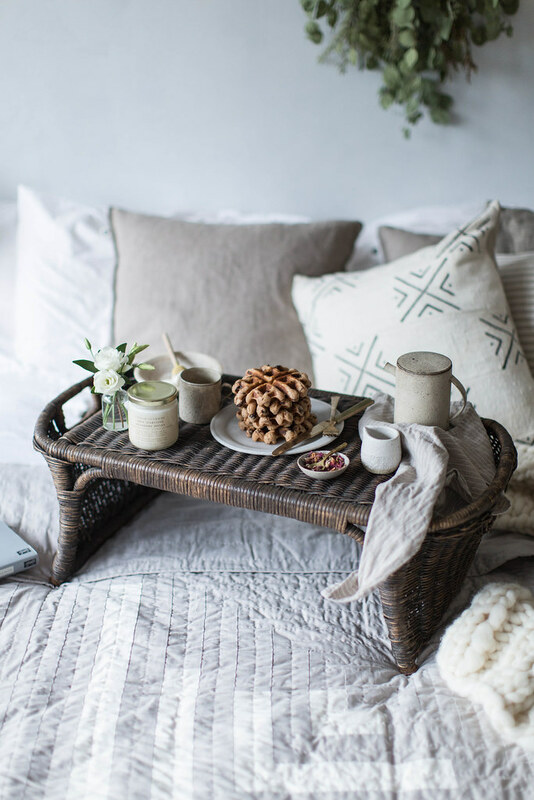 Still, that quilt is beyond beautiful and cozy, and makes me dream of a breakfast in bed, something that has died for me ever since my son was born, lol!! I also don’t agree with the motto that you are either born a morning person or not, I used to be such a night owl in my teens, my twenties, and first half of my thirties, and I now find myself being a morning person through and through – oh how age has changed me!! Agreed! Not everyone (or even most people) can afford certain goods and works of art. But that would never stop me from supporting an artist or encouraging the fortunate few to support them as well. Just because I can’t buy great works of art doesn’t mean that I think it’s horrible that anyone dare suggest paying thousands of dollars for a painting…I’m glad that some people can afford to give painters that even though I can’t! And I hate that so many of us are forced by circumstance to participate in an unsustainable system. If you are living and breathing in this country, you’re a part of it. We all are. It can’t be helped. I’m an advocate of even the tiniest changes that make a difference. I don’t think we all need to only shop at farmer’s markets & buy handmade goods (though what a beautiful fantasy that is! ), but I do encourage those who can to support artists and makers. And I encourage everyone to make the little changes like allocating some of the weekly food budget to local produce. I think the most important thing is to live within our means & take care of our families the best we can. There is no shame in doing that, however we have to do it. I think about my grandmother who worked in a hosiery mill & my grandfather who worked as a machinist…they couldn’t afford nice clothes for my mother, so my grandmother sewed her beautiful things by hand. These days a lot of those skills are lost or working mothers don’t have the time, but I look to my grandparents for inspiration on how to live well with little. It can be done but it isn’t easy. At the end of the day, I’m for everyone. Everyone’s path is different. I totally agree with you, as my grandparents are my role models, and although I live in Europe I can see how the same applies in here – for instance, where I live I don’t have access to a farmer’s market where I can support local produce, but whenever I’m at my mother’s summer house I always do that, because I can go to the nearest farmer’s market, support local producers and buy better produce at lower prices than I would shoppping supermarkets at my local town!! I’m for everyone, really, to live as they can afford and how they best feel happy to, and wouldn’t I love to be able to buy certain art pieces!!! Good on you Beth for supporting quality and ethically made goods. People make their living this way. Your blog is my very favourite, thank you for making my life more beautiful. Wow! I am a quilter and 1200 dollars is not a lot for a beautiful handmade quilt. So much time goes into one, I hope that the comment is just coming from ignorance of that fact. When someone is selling a handmade item why wouldn’t they deserve a fair price? I am appalled by slave labor and the falsehood that it has put forward into people’s minds that handmade items are and should be “cheap”. Oh god that’s the bedroom to die for!!! 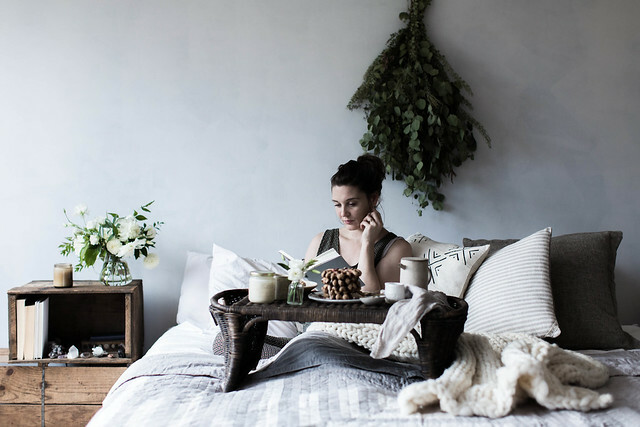 Interior design should be another major part of your blog too! Beth I’d love it if in future you could mention where a few of the other props in your photos are from! Love the look of these. If I can ever get my lazy arse into gear to search for the ingredients (Darwin is fairly bereft of interesting suppliers) would love to try making some. 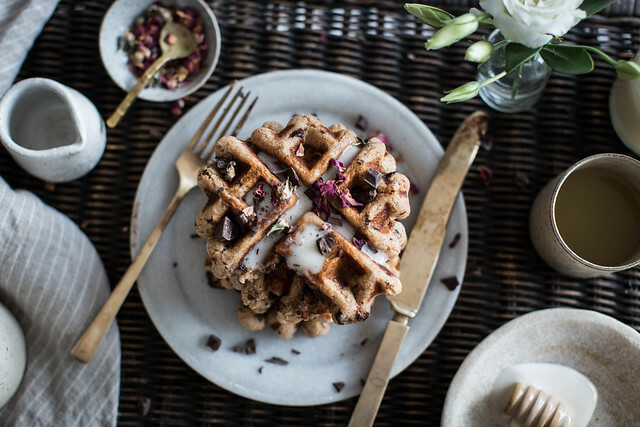 For the Waffle iron hunters, Etsy has some fantastic ones! 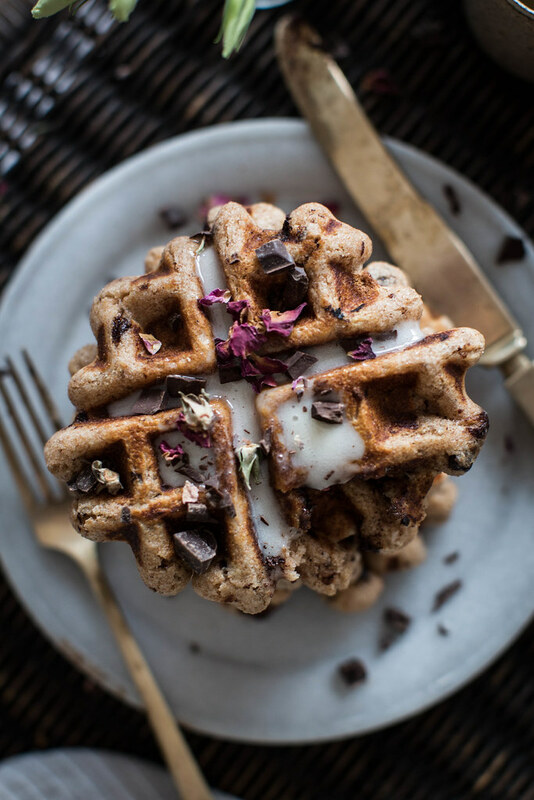 Your waffles are so beautiful! I tried to search your website, as I’m sure you’ve answered this question before, but to no avail. What brand is your waffle iron? 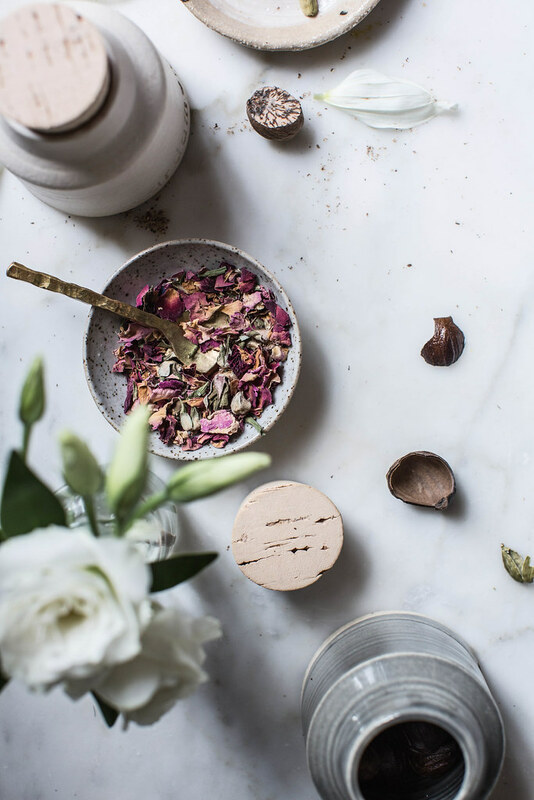 This post has convinced me that I need one right now… Love your blog and photos! Blogging about durable, artisan goods is a lot different than flaunting the affluent, fashionable lifestyle of the moment. The unsustainable machine we call our modern capitalist society, sells us the dream of owning more. While some make careers out of marketing THAT lifestyle, some, like Beth and other dedicated bloggers, give voices to things that are made to last. So if you cannot afford the item featured by a beloved blogger, you do have newfound Consciousness about quality and ethics regarding an item you desire or will need one day. I personally couldn’t afford the item either at this time in my life, but you can always look for secondhand items that align with the values of artisanal, sustainable industry. You don’t have to be a first hand consumer to support quality. Thank you for opening my eyes to all the handmade makers you support. Sweet gum co spoons are now a part of my kitchen because of you!!! Hi, can you please make a variation of this recipe for us who do not have items like spelt flour, cardamom seeds, coconut yogurt or oil and coconut milk in cans only, and are without rosewater or agave syrup in our countries? Thanks in advance. This is such a beautiful, beautiful piece. The photos are so effortlessly lovely and your words are so well put. I too, have been striving towards less hurried mornings – ones that allow one to take time to be thoughtful before the bustle of the day begins. Utter perfection! Love that blanket, it’s getting cooler out and it’s the perfect time to cozy up to the perfect warm and soft blanket! 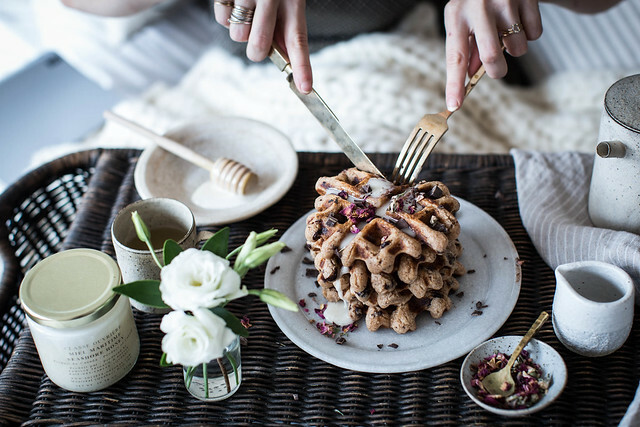 Also – those waffles look fabulous. Waffles are my favorite morning scent, after coffee of course. You guys are so cute! I absolutely love your blog – it’s not only about the recipes and the delicious-looking food photos. Everything here inspires and expresses beauty and genuineness. It’s an art form, it’s the way you express yourself. 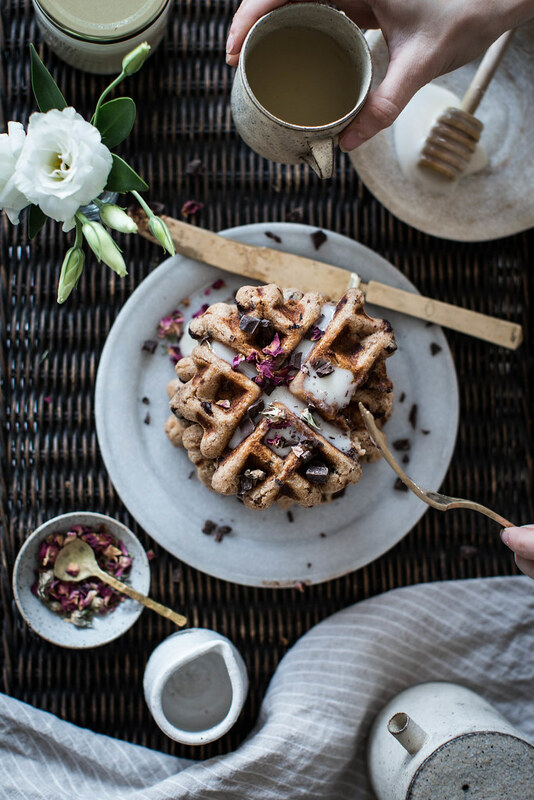 Again, I am thrilled by your wonderful pictures, the perfect settings, the lovely colours and of course the great waffle recipe. What a stunning blog! Always happy to see your inspiring work. Have a sunny day! 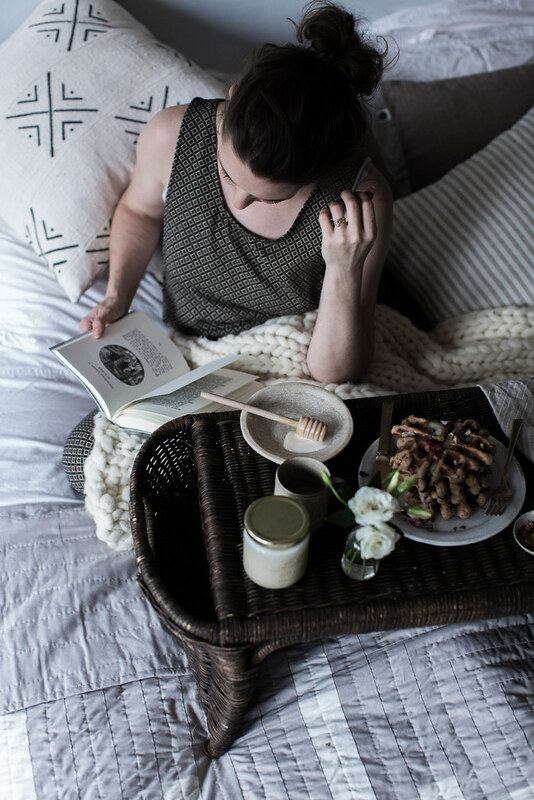 I wrote of Breakfast in Bed on my blog just the day before this post, was so lovely to read yours, my favorite being the greenery about your bed. My mother was a quilter, there is nothing quite as cozy as a handmade quilt and they really do get better with time! much love and respect for all that you do Beth. 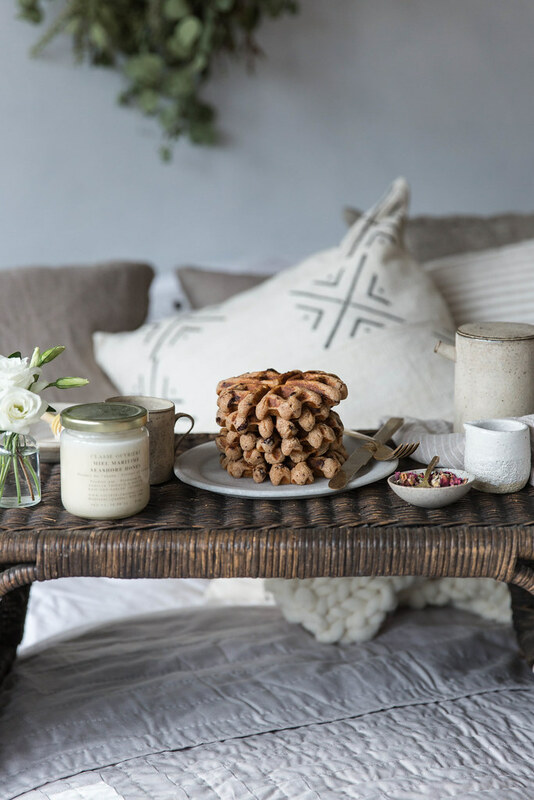 Wow, I love the look of those amazing looking waffles, and what a fabulous place to enjoy breakfast in bed, I love the wicker tray! Das sieht so unglaublich gemütlich aus und das Rezept für die Waffeln klingt auch richtig lecker! 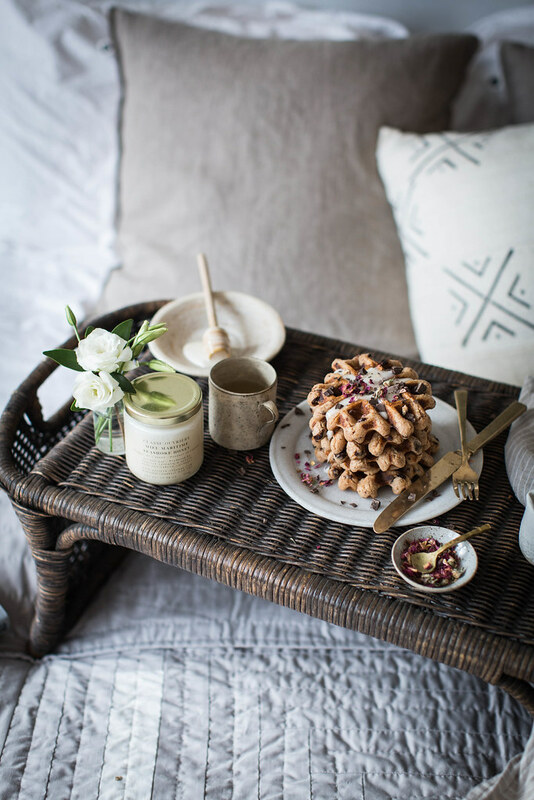 But where to find the lovely woven serving tray? Nice blog and nice photos. Your beautiful quilt does look delightful. Also your morning routine is a dream come true. Hopefully I can convince one of my family members to fix this recipe for me! Thank you for sharing. These look amazing! I will definitely try these out! What are the greens hanging above your bed? Totally agree that craftsmen should be paid for their work by the way. Beautiful post, do you mind sharing what color paint is used on the walls? Hallo ! Love , love , love your posts .. please could you tel me what the herbs are hanging above your bed ? The waffle looks great! I’m glad there is CHOCOLATE in that recipe, this is what I was looking for. I must try it for my family. Where is the breakfast tray from? I love it! Hi Beth! I love your posts on Instagram and just started following your blog. My life is so full of too much and I am trying to work on the art of slow living as a teacher and a mom and wife. The one thing I want to work on is enhancing my cooking skills. May I please ask where you purchased the plates used for the pancakes, and what they are made of? Thank you ever so much!! I look forward to being inspired by you each time I see your posts! Breakfast in bed is such a luxury! And these waffles to enjoy makes it that much grander! Thanks for sharing your inspiration! This looks absolutely delicious, would love to make these one day! Hi Beth! I seriously can’t stop looking at your blog over and over again. You truly are an inspiration!! Question what plants are the ones you are hanging above your bed? Are they fake or reserved? I recently bought reserved eucalyptus, but one of he bundles had larva so I. Sort of concerned the other bundles get the same 🙁 .. I would love to know which plants you are using. 🙂 pretty please?! Hi Beth, I just found your blog and fell in love less than one second!I am wonder how you edit your photos? Do you use any special preset? No special preset..just good light! I just came across this post. A little late, I guess. It is beautiful! It’s nice to heard that someone else has trouble with mornings. I thought that after working full time for years and having children I would switch to their routine of waking up early, happy and awake. This has not been the case and I would sleep part of the morning away if that was an option. Everyone operates a bit differently I suppose.